Shalom Hartman Institute President Rabbi Dr. Donniel Hartman, and SHI-North America President Dr. Yehuda Kurtzer recently taught at the launch of the third cohort of The Berrie Fellowship, a two-year intensive Jewish learning and leadership education program for a select cadre of leaders in Northern New Jersey. The Hartman Institute is working closely to help develop the curriculum for this two-year program, which is funded by the Russell Berrie Foundation, and will include a week-long seminar in Jerusalem in July 2012 that will be taught by a faculty of SHI fellows. The two-year program kicked off with a three-day New Member Institute which took place in Tarrytown, NY in August. Participants attended leadership sessions presented by collaborating faculty Dr. Erica Brown and Marty Linsky and joined Hartman faculty in grappling with provocative questions such as, What is a Jew? Who is God? and What is Judaism? 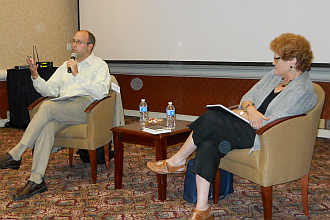 An evening program of the Institute brought together members of the previous two cohorts, many of whom are now senior community leaders, for “A Conversation with Dr. Deborah Lidpstadt,” facilitated by Dr. Yehuda Kurtzer. The Berrie Fellowship is focused on making the Northern New Jersey Jewish community stronger, more dynamic, inclusive, and responsive to an ever-changing environment.